The late, great Mike Wieringo teamed up with writer Mark Waid to create one of the best runs on the Fantastic Four, only trailing Stan Lee and Jack Kirby’s collaborative work, in terms of quality. Together, Wieringo and Waid put humor, action, sci-fi, and heart into the four-sided world of comics. 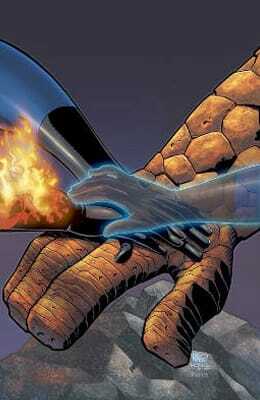 And in Fantastic Four #524, the duo's last issue, Wieringo illustrated one of the simplest covers on this list. It's simply the Four’s hands locked in unison, referencing a memorable moment from their first-ever appearance. Being simple doesn’t make this cover any less iconic, though. Wieringo always put storytelling ahead of flash, and the above image is a perfect example of that. He could have drawn a highly detailed cover that showed off his skills but took away from the tone and direction of Waid’s script; more thoughtful than that, Wieringo stripped the team down to its essence and created a classy cover that kept the spirit of Waid’s script and tone intact.